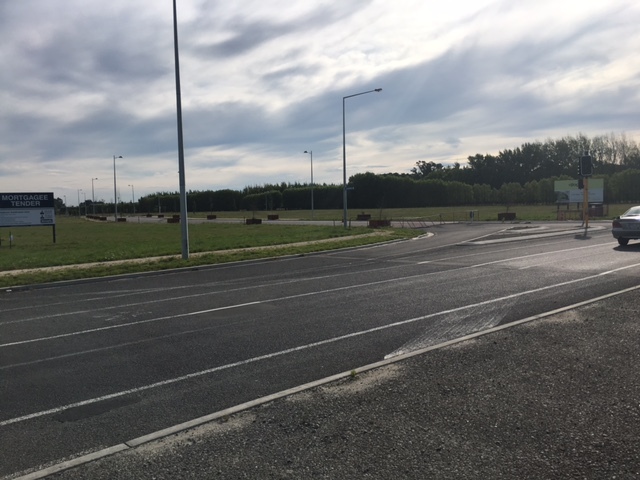 Wed, 20 Jan 2016 at 6:35 p.m.
Last year Delta told Council and Dunedin ratepayers to return to their seats and not to worry about a bit of financial turbulence on the Yaldhurst subdivision, pictured. Delta are owed several million (possibly more) and the story was that all is well, even though they have been not paid for about 18-24 months because they have security over the land. Sadly for Delta and its owners (us) a security means Jack Squat if the FIRST mortgage or prior ranking securities have not been paid. And of course the first mortgage holder can simply choose to force the sale, and IGNORE lower ranking securities, until all their loan, penalty interest, selling costs, legal fees are covered. 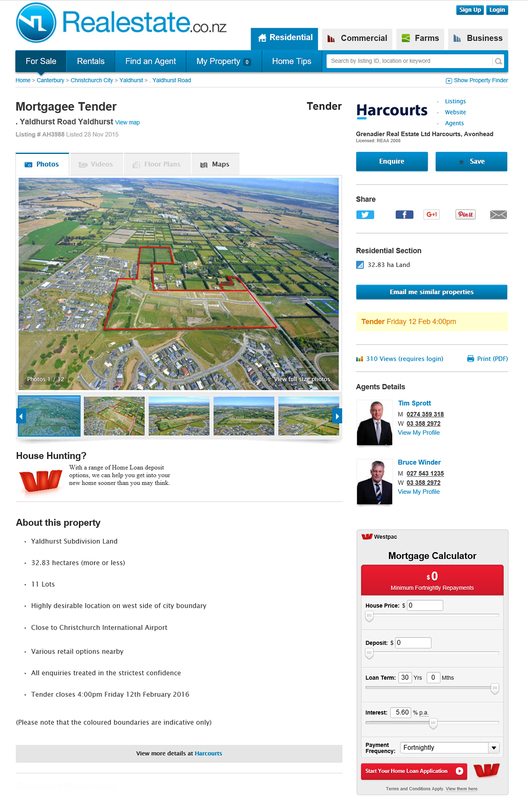 The question of interest is – what is an unusable subdivision going to fetch, Jack Squat perhaps ? 1. How much is still owed ? 2. Have they been paid anything on this project in the last year ? 3. What do they know about the forced sale process ? 4. What is the total amount of debt secured against the property that ranks ahead of them ? 5. What is the range of the estimated mortgagee sale price – just a range is fine thanks ! 6. Is the company owing Delta solvent, and does it have any other assets that can be pursued ? 7. Which group of directors at Delta authorised this multimillion-dollar project ? 8. Did Delta themselves know or check that the subdivision was not designed to the CCC requirements before they started ? 9. Will anyone be held accountable for this spectacularly inept decision to be involved and any loss resulting ? 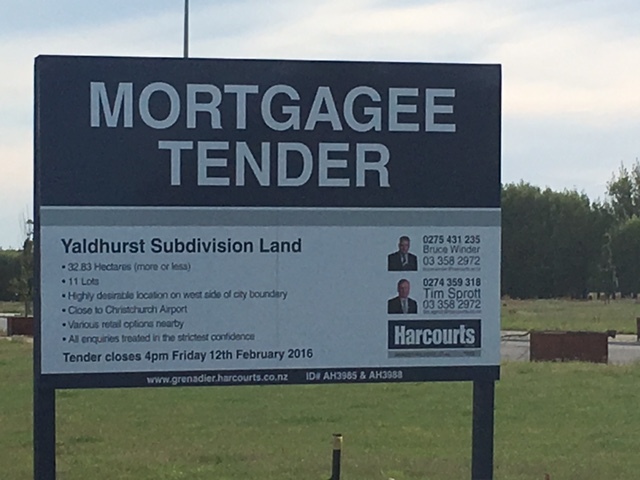 1.4.15 Christchurch subdivisions: Heat gone? 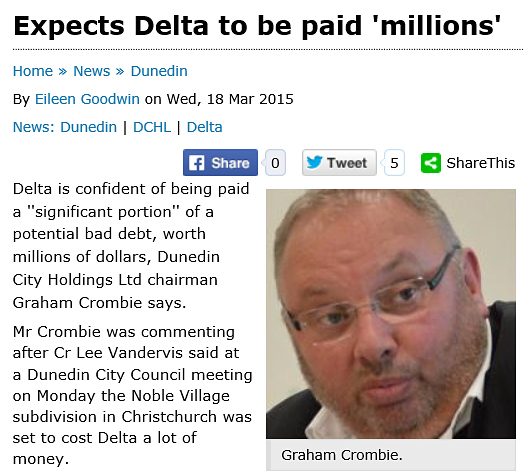 The ODT haven’t been on top of this Delta drama in the last ten months or so, why would that be do we think. Well, actually, for some time before that and then some. Ratepayer-owned company and all. Performance. Annual Reports. That sort of thing. The business history for Luggate/Jacks Point should have raised the tortoise’s head when Noble first got mentions at The Press. What, no hungry business journalists south of the Waitaki. No money for investigative journalism. These and other searching questions to complement CD’s at the post. Obviously, CD got a sharp shock yesterday on their trip through Yaldhurst. Not sure the Auditor-general can glance over this one. Tender was to close tomorrow Friday, 22 January 2016 at 4pm. see earlier post. Yet another $496K (Delta CEO’s salary) blunder of huge proportions. Graeme Crombie ought to be put on the rack by the ODT on this one. Will he? If they don’t, would we expect the Mayor (the citizens protector) to front up and do his duty by the citizens. Don’t hold your breath. Receivers are appointed by banks to recover money for them. Delta will get zero. Any chance of a divvy will be sucked out by the receiver at $25k per week. Wait, there’s a suggestion that Aurora is insolvent? There is a business connection but the earlier Tag to this post was a hang over from an earlier post on the topic and has been removed – wasn’t there to imply the company is insolvent. Grady Cameron is the chief executive for Aurora Energy Ltd and Delta Utility Services Ltd.
Aurora’s distribution assets are operated and maintained under contract by Delta Utility Services Ltd. I could be wrong, but I think CEO Grady Cameron is Aurora’s only employee. It is to all intent and purpose Delta’s gig. Probably a fiddle to make way for more director’s perks and a double salary for the CEO. It is in effect a cash cow for the DCHL group, and not to mention a serious financial prop for DVL and DVML via tax free subvention payments. These of course require cash surpluses to happen. Cash via citizens’ power line and meter charges are guaranteed and regular. Aurora is a racket to charge new developments outrageous fees to establish infrastructure for electricity generation. Why a lines company should not build its own lines to generate and distribute electricity is one of the great acts of larceny by trick since deregulation. What does this mean for those with contracts on the land? They are still advertising all the sections with half of them showing as under offer. Means interesting times ahead, and action for address. Sorry for the ignorant comment, but I just don’t see a good outcome for those with contracts under offer. Would the contracts be cancelled? Not at all ignorant, Annie1. Not sure what’s going to happen, a few levels to this one and no-one’s talking at Delta. Have people on this, will be posting updates.